The new regional sporting and recreation complex at Tuggerah has been renamed the Central Coast Regional Sporting and Recreation Complex following a unanimous resolution of Central Coast Council. A staff report from the Directorate of Assets, Infrastructure and Business, recommended the name change be adopted prior to the practical completion of the facility, which is currently under construction. Procurement and marketing campaigns are due to be launched in an effort to attract mass participating events with regional economic signifi cance. According to the report, the current complex name, Tuggerah Regional Sporting and Recreation Complex, was created prior to the formation of Central Coast Council in May 2016. Funding for the development of stage 1 of the complex was acquired through a $10m Australian Government grant, with a further $13.71m committed by Central Coast Council. Stage 1 covers 18.28 hectares and will consist of nine playing fields, public amenities, and car and bus parking. Currently unfunded, stage 2 consists of a proposed multipurpose indoor centre and grandstands for the premier field. “This is the largest community infrastructure project for sports and recreation on the Central Coast and will be the first of its kind in the region, realising Council’s tourism vision to become a premier destination for large scale and regionally significant sporting events,” the report said. 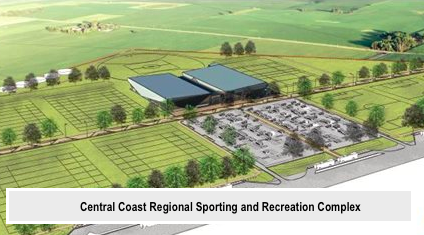 In January the Federal department of Infrastructure and Regional Development confirmed that the proposed name change to Central Coast Regional Sporting and Recreation Complex was acceptable.